This is the second of a series of three articles on the National Capital Band’s ministry weekend in Winston-Salem, North Carolina. On Saturday morning, the band traveled to the Ken Carlson Boys and Girls Club for a day of music clinics from the Academy of Music and Arts. The Academy is an intensive after-school program for young people (ages 8 – 18) wishing to develop their musical talent. Over 40 students were present for the clinics. The clinics began with all of the participants gathered in the gymnasium for Dr. Kellner’s “breathing and buzzing” clinic. Following this, the group was split into several classes, by instrument and skill level, with one or two members of the National Capital Band assigned to each class. These individual sessions lasted for an hour, after which the clinics broke for lunch. After lunch, the three bands from the Academy (Beginner, Intermediate and Advanced) were given time to rehearse in preparation for an afternoon demonstration concert with all three groups and the National Capital Band. The concert opened with the NCB playing Praise Him! (Stephen Bulla). The Beginner Band, conducted by Court Wynter was up next, presenting the hymn tune “Boston”. While the Beginner Band took their seats in the audience and the Intermediate Band, conducted by David Zuniga, came into the band formation, the NCB played Keep Singing (P. C. Rivers). After the Intermediate Band’s selection had concluded, the concert continued with Soli Deo Gloria (William Himes), again played by the NCB. The Advanced Band, under the direction of Steve Sutton, was up next. Remarkably, every player in the band is a student in the Academy of Music and Arts – there are no adult “ringers”, with the exception of the soprano cornet. Their first item was the march Brazil 75 (Leonard Ballantine). This was followed by the NCB’s principal euphonium, Joel Collier, who presented the last movement of Spiritual Fantasy (Douglas Court), “Joshua Fit the Battle”, accompanied by the NCB. The highlight of the concert was the Advanced Band’s presentation of one of the classics of Salvation Army brass band literature, Brian Bowen’s meditation on Psalm 23, My Comfort and Strength. This is a challenging work even for experienced bands, and, although the performance was perhaps not as polished as one by a staff band, it was remarkable for its musicality, poise and impact on the audience. The afternoon concert concluded with two items where the students combined with the National Capital Band. First, the members of the Advanced Band joined in Christmas Joy (as had been done during the previous night’s concert). 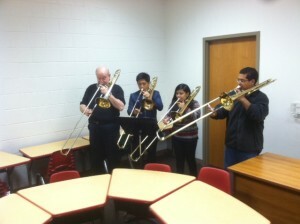 Then, all of the students were featured in William Himes’ Classics in Brass. After the conclusion of the music clinics, the National Capital Band made the short trip to the First Presbyterian Church in Winston-Salem, the venue for the evening concert. This concert was named for Jack Sutton, Jr., a member of the Salvation Army Advisory Board from 2001 – 2010, who passed away on 27 November 2011. Sutton was a deacon at First Presbyterian. It is intended that this festival become an annual event featuring a Salvation Army brass band. After setting up in the theatre-style sanctuary, the band had some relaxation time at the church. They were then treated to a catered dinner, generously provided by the Sutton family. The program for the concert was the same as for the Friday night concert, except that The Call was replaced by In Perfect Peace (Kenneth Downie). As on Friday night, the Advanced Band from the Academy of Music and Arts played in the foyer before the concert. The drum line, under the direction of C. J. Powell (who is a member of the drum line staff at Winston-Salem University), “played in” the National Capital Band as they took the stage. Major James Allison, area commander, made a special presentation to the Sutton family at the opening of the concert, acknowledging Jack Sutton, Jr.’s service to the Salvation Army and to the community at large. On stage for the presentation were Betty Sutton (his wife), Betsy Hoppe (his daughter), Jack Sutton III (his son) and Peter Sanderson (his first cousin). Also featured during the concert was the Singing Company from the Kernersville (Korean) Corps. This singing company was the winner of the divisional singing company competition this past spring and represented the North and South Carolina Division at the territorial singing competition in June 2013. The National Capital Band (Bandmaster Dr. Steve Kellner) announced some personnel changes at the beginning of the 2013 – 2014 season. The band says farewell to Ruth Choi, whose officer parents were appointed to the staff of Evangeline Booth College in Atlanta. Also leaving the band are Esther Kim and Sam Kim, who will both be attending the University of Virginia. Josh Sears also has an educational commitment that will keep him from participating for at least the first half of the season. Jim and Susan Shiels were appointed to the Suffolk Corps in southeastern Virginia and have resumed full-time service as officers with the rank of Captain. Despite the long distance, Jim will continue to play in the band, but Susan will be stepping away. Joining the band are Majors Tim and Donna Carter, Tim on first horn and Donna on second cornet. The Carters were appointed as area commanders in Central Virginia (Richmond) over the summer. Also joining the band from the Richmond area is Sara Elliott, who has moved from Oklahoma to take the position as music director for the Central Virginia Area Command. Sara will be handling the flügelhorn duties. The Fredericksburg Corps has also hired a new director for its music programs. Kate Wohlman comes over from England to fill this spot and joins the NCB on Bb bass. The bass section is also bolstered by Lieutenant Trey Jones, corps officer at Alexandria Citadel, who has played with the band as a substitute several times in the past couple of years but has now committed to a full season. Also joining the band from Alexandria Citadel is Troy Stupart. Both Trey and Troy will be on Eb bass. In addition to new players, there have been changes in the cornet and horn sections. Danielle Ashton moves from first cornet to solo horn. John McKee, who joined the band in the middle of last season, moves from solo cornet to first cornet to fill Danielle’s spot, and Rebekah Schramm moves from second to first cornet. On Monday evening, 4 February 2013, the National Capital Band (Bandmaster Dr. Steve Kellner) was privileged to have well-known composer and conductor James Curnow as guest conductor for its rehearsal. Curnow is one of the most well-known active Salvation Army composers, and has also published many works for concert and wind bands. In the Washington, DC area to supervise the recording of a demonstration CD for the American Instrumental Ensemble Series, he graciously agreed to come to the city early in order to conduct the rehearsal. The band is featuring two of his works in its concert repertoire this season, the devotional selection Guardian of Our Way and the extended work The Great Salvation War. The guest conductor handled the entire rehearsal, beginning with taking the band through some of his Tone Studies for Band. The next item was the song arrangement O How I Love Jesus. Insights given by the composer as the band rehearsed this simple yet profound piece enhanced the meaning for the members of the band. He also took the band through the to items from their concert repertoire mentioned above, spending nearly half the rehearsal time on The Great Salvation War. As with any piece of descriptive music, the understanding of the meaning of the work by the players is crucial to an effective performance, and Curnow’s descriptions of the various motifs and themes used throughout this extended work gave this understanding to the band. At the end of the rehearsal, the band had a brief lesson in sight-reading as the guest took us through his composition Emblems, which many of the members of the band had never seen before this rehearsal. In addition to the guest conductor, the band also welcomed back former member Bernie Dake, who is now a member of the music department staff at Territorial Headquarters in Atlanta. Bernie was also in town for the recording sessions to be held later in the week. For the fifth consecutive year, the National Capital Band (Bandmaster Dr. Steve Kellner) visited Gaithersburg Presbyterian Church for the church’s Winter Hymn Sing. This year, the band began with a “mini-concert”, playing five items before the event began. These included three hymn tunes arranged by Eric Ball, Angelus, Laudes Domini and Lobe den Herren. Also featured in this section were Jesus Loves Me (James B. Anderson) and St. Francis (William Himes). The bulk of the event, as is evident from the name, consisted of the assembled congregation singing a variety of song – a total of fifteen. Ably led by the church’s director of music, Ann Y. Schmidt, and assisted by organist Mark Hanak, the event moved smoothly from item to item. During the program, in addition to accompanying thirteen of the fifteen songs, the band presented the third movement of William Himes’ suite To the Chief Musician. The singing drew to a rousing finish with the band, organ and congregation joining in Crown Him with Many Crowns (arr. Charles Skinner). As in previous years, the Hymn Sing was followed by a chili dinner in the church fellowship hall. Members of the church provided a dazzling variety of chili, with everything from traditional beef to venison to chicken to vegetarian. One rather unusual choice this year was a Moroccan chili, with exotic spices served over a bed of couscous. The Winter Hymn Sing has become a favorite on the National Capital Band’s annual schedule, and this year was no exception as the band enjoyed good music and good fellowship with the members of Gaithersburg Presbyterian Church. This is the second of a two-part series of articles on the band’s ministry weekend in the Tidewater area of Virginia, 5 – 6 November 2011. On Sunday, 6 November 2011, the National Capital Band (Bandmaster Dr. Steve Kellner) returned to the Norfolk Corps to continue their ministry weekend in the Tidewater Area. Sunday activities included morning worship and a praise concert in the afternoon. The morning Holiness Meeting began with a series of prelude items by the band, including Angelus (Eric Ball), Jesus Loves Me (James Anderson), Be Thou My Vision (Steve Kellner) and St. Francis (William Himes). With members of three different corps in the area (Norfolk, Hampton and Portsmouth) gathered together, the hall was full beyond capacity. During the service, the band participated in the praise and worship time, which was led by Jason and Joel Collier, and included Come, Now Is the Time to Worship (arr. James Shiels), Jesus, Messiah and He Knows My Name. The band also featured Paul Sharman’s arrangement of The Power of the Cross. The message of the morning, which was given by the band’s executive officer, Major James Allison, was based around the theme “The Light of the World“. The band played Dean Goffin’s magnificent and moving mediation before the message, and Major Allison used the imagery of this music and the painting which inspired it to exhort the congregation to allow the Savior to enter into their lives. Following a lunch in the corps gymnasium, the band and congregation returned to the chapel for an afternoon Praise Concert. The band kicked off the afternoon with Goldcrest (James Anderson) and then accompanied the congregation as they sang Joyful, Joyful. Other band items included The Ambassadors (Peter Graham) and The Firing Line (Bruce Broughton). Three of the band’s featured players also presented items. David Delaney (cornet) and Noel Morris (soprano cornet) offered Quicksilver (Peter Graham) and principal trombone Kevin Downing gave an exuberant rendition of Joshua (Pearce/Kaiser, arr. Kevin Hayward). As the praise concert ended, the band concluded the ministry weekend with The Risen Savior (Paul Kellner). A busy weekend of performances and teaching, although tiring, was inspiring and uplifting for the members of the band. The band would like to acknowledge some substitute players who filled in for the weekend: David Adams (solo cornet), Patrick Morris (euphonium) and Dan Dobney (Eb bass). We appreciate your efforts during the weekend.